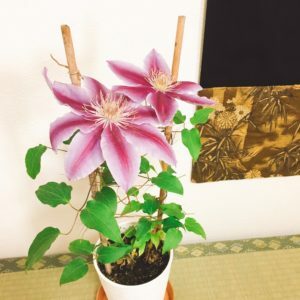 The season of Tessen (clematis) has come! Tessen, after which we named our tea room, is now in its season. This means one year has passed since we started this business. Our beginning was as a volunteer host family. I was grown up in a family who enjoys hosting guests from overseas and it was quite natural for me to be a host family in my own family after marriage. We showed the guests our life-time hobby,Tea Ceremony and also enjoyed cooking together when we had spare time. As the number of request for home-staying is limited, and as my mother moved her tea ceremony class to a convenient location, we decided to open our door to tourists, not only home-stay guests. That was just one year ago, 2018 April. Looking back the past one year, we’d like to show our appreciation to all the guests who shared their precious time with us, people who had helped and supported us. One year,but just getting started, not so many things have done yet. We reconfirm our goal, how we can make our guests happy, and will keep going!